The Bird Jolt Flat Track produces a mild electrical shock when birds land on a surface. 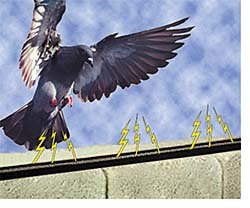 The shock does not harm the birds but conditions them to stay away from the area. The anti-arcing technology increases the surface area of the track, and the glue-trough design prevents arcing underneath the track and helps the track stay on the surface. The system is available in a variety of colors and in 100-foot rolls.